WaitForCrossBarClose- A trade will only occur after the bar where the cross occured closes. Ma1period- Period value for first MA. Ma1shift- Shift value for first MA. 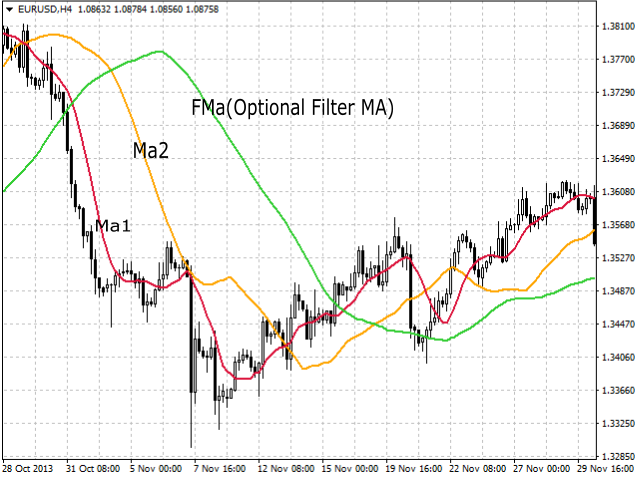 Ma1method- Moving average method. Set 0 for simple, 1 for exponential, 2 for smoothed and 3 for linear weighted. Ma1appliedPrice- Moving average applied price. Set 0 for close price, 1 for open price, 2 for maximum price, 3 for minimum price, 4 for median price, 5 for typical price and 6 for weighted close price. Ma2period- Period value for second MA. Ma2shift- Shift value for second MA. Ma2method- Moving average method. Set 0 for simple, 1 for exponential, 2 for smoothed and 3 for linear weighted. Ma2appliedPrice- Moving average applied price. Set 0 for close price, 1 for open price, 2 for maximum price, 3 for minimum price, 4 for median price, 5 for typical price and 6 for weighted close price. ActivateFilterMA- Activates or deactivates the third or filter MA. FMAperiod- Period value for third MA. FMAshift- Shift value for third MA. FMAmethod- Moving average method. Set 0 for simple, 1 for exponential, 2 for smoothed and 3 for linear weighted. FMAappliedPrice- Moving average applied price. Set 0 for close price, 1 for open price, 2 for maximum price, 3 for minimum price, 4 for median price, 5 for typical price and 6 for weighted close price. MagicNumber- Magic number for the EA. Must be different on each attachment only if attached to multiple charts of the same currency pair. BrokerIsFiveDigit- Set to true if your broker is five digit. If your EUR/USD has five decimal places then your broker is five digit. In the EA, a buy signal or uptrend is when the first ma crosses the second MA upwards and if the filter MA is activated then the filter must be below the price too. A sell signal or downtrend is when the first MA crosses the second MA downwards and if the filter MA is activated then the filter must be above the price too. Best MA Cross EA I have found on the market yet. I'm still using it on a practice account before I give it the reigns to my live account, but so far quite pleased. Thank you! Good ea! But you must optimize the setting parameters. Still needs a few bugs to be ironed out. Trailing stop does not work unless you have a SL set at the start. Needs a filter to eliminate the weak crossovers. Update: author fixed the trailing stop issue now. Works well at higher time frames. Not bad as part of a trend following system. Updated trailing stop to allow trailing even if stop loss wasn't initially set. Several bugs have been sorted. Update on functionality of the MA filter when turned on to remove a bug. In this version, the FMA is checked for its position above or below the other two MAs rather than the current price.